As the entire country looking forward for the reforms for the demonetization which are going to be announced in the budget-2017 section in parliament by the FM Mr. Arun Jaitley on 1st of February 2017. Here are the some highlights and notable key features about the rail budgets which if often given the importance in parliament and one and only firms which got separate budget sections for its own. Indian Railways officially has the acronym of IR which is the responsible for the both passenger and for the goods transportation in rail transportation. Being, one of the world’s largest and finest rail networks all around the globe, the Indian railway has the separate ministry and also has the separate budget which will be submitted by the railway minster. In the current NDA government led by Mr. Modi, Mr. Suresh Prabhu was appointed as the railway minster that tends to present his budget in the parliament, along with the presentation of the union budget of India 2017. This will be the first budget section which will inherits the rail budget as the part of the general budget which is about to be presented in the parliament session. The current FM who himself quotes on his statement recently as the central government moving toward the new era where all things will be done coordinal form. In recent time, the Indian citizen experiences some devastation rail accidents across the nation. In order to overcome the issues and to provide better safety for the travelers of rail, the upcoming rail budget might include several reforms and announcements in terms of rail safety purpose. Also it is expected that this upcoming rail budget would includes some hike in the fund allotted for the rail safeties. On accounting the recent rail accidents which makes some serious shatter among the rail travelers, it is expected that the railway ministry would allot around 1 lakh crore for the rail safety purpose. Also, the experts all over the nation believes this upcoming rail safety management will be revised over the year gap of 5 years and funds will be introduced on such time periods for rail safety protocols. With the intention of driving people towards the digital form of payments, the service charges for online transactions has been withdrawn for the temporary period by the central government, owing to there has been some significant hike in the online train booking. So, it is expected the rail ministry might withdraw the service charges for tickets booking via IRCTC. In order to improve infrastructure among the several railway stations, and to provide better facilities for the disable citizen the rail minister might allocate some funds for placing lifts and escalators. Also, to boost the devotional sprite among the Indian citizens and to boost the pilgrimage, it is believed that rail ministry will introduce certain amount of special trains for satisfying pilgrims and tourists across the nation. By joining hand with private sectors, the rail ministry is planning to improve the rail facilities for its users. It is widely believed that this budget will includes the coverage of fixing bio-toilets on trains and to get rid of the unmanned railway gates/level crossings. 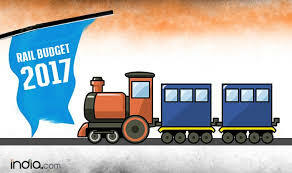 Apart from those attractive features, the upcoming rail budget would includes announcement of introducing new metro rail systems in major cities and also it will drive potential youths to get jobs in those departments.